In the world of managing and growing your career, I am so grateful to LinkedIn as the go-to resource. Do you remember hunting for new connections by making phone calls, tracking down leads from newspapers and magazines, and even cold-calling a company? Now, you can find and meet helpful people with ease. LinkedIn also provides great articles and resources so you can readily find out the latest developments and trends in an industry or function. 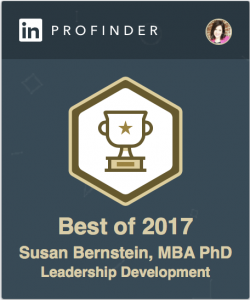 As an executive coach and leadership consultant, I’ve been fortunate that many of my clients find me through LinkedIn. As a result, I’ve been able to have a positive impact in many organizations. For example, I helped a senior leadership team at a major financial institution to overcome some entrenched conflict, so the team members could get back to innovating for a huge shift ahead. I helped an executive at an architectural firm to look at their work in a different way and design a lucrative new revenue stream. I helped a leader in turmoil to regain her confidence after a nasty internal political situation, and now her company values her immensely and she’s getting to build a technology she’s envisioned for many years. 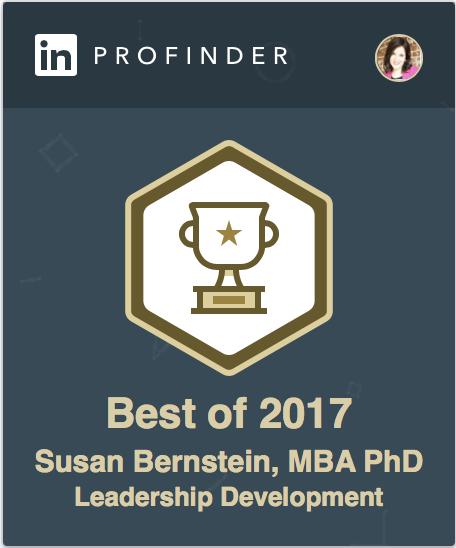 I’m extremely honored to be recognized by LinkedIn as one of the “Best of” coaches for Leadership Development in 2017. They just reached out to me this week to let me know. What shift do you want to make in your career? How would you like to elevate your leadership? I welcome you to set up a complimentary, no-obligation “get acquainted” session with me to discuss what’s happening and explore how a coaching relationship can help you to move in a positive direction and attain your goals.